Choosing contemporary over more traditional styles often means keeping it very simple with minimal designs, modern materials and careful use of colours. We work with your ideas and ensure we create a practical design with the space you have, which will look amazing alongside your home. Form over function? Or function over form? It’s a perennial question for diligent contemporary garden designers. 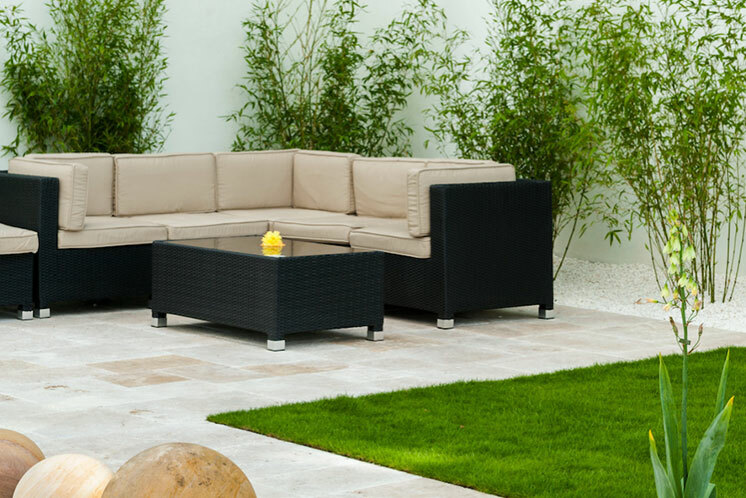 We’re eager to reach your garden’s full aesthetic potential but we must meet your requirements. This garden is a mix of both. By placing the functional areas out of sight by the house, we made them more accessible and ensured they don’t interfere with the lines in the rest of the garden. 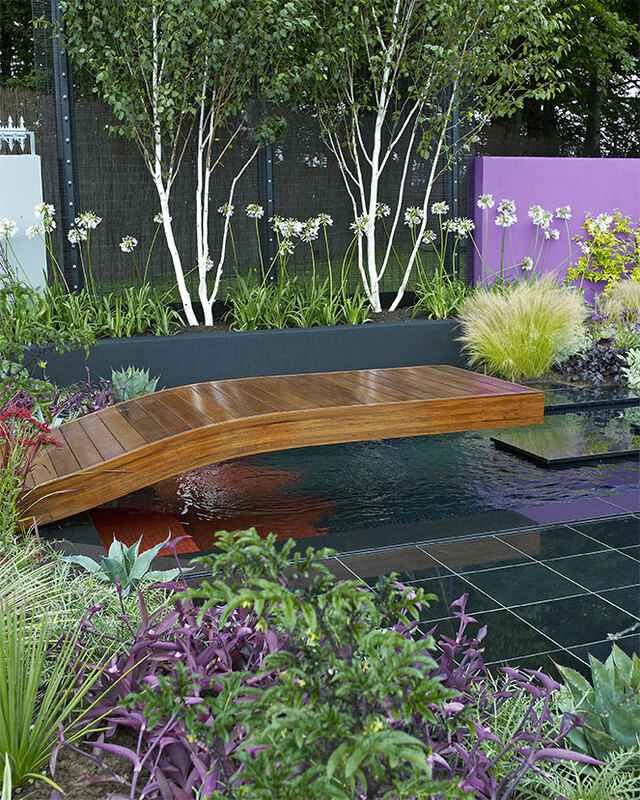 The result is two modern garden designs in one. There’s our contemporary take on a cottage garden and then there’s our modern live-in artwork, with its playful twisted topiary and striking, deconstructed gazebo. 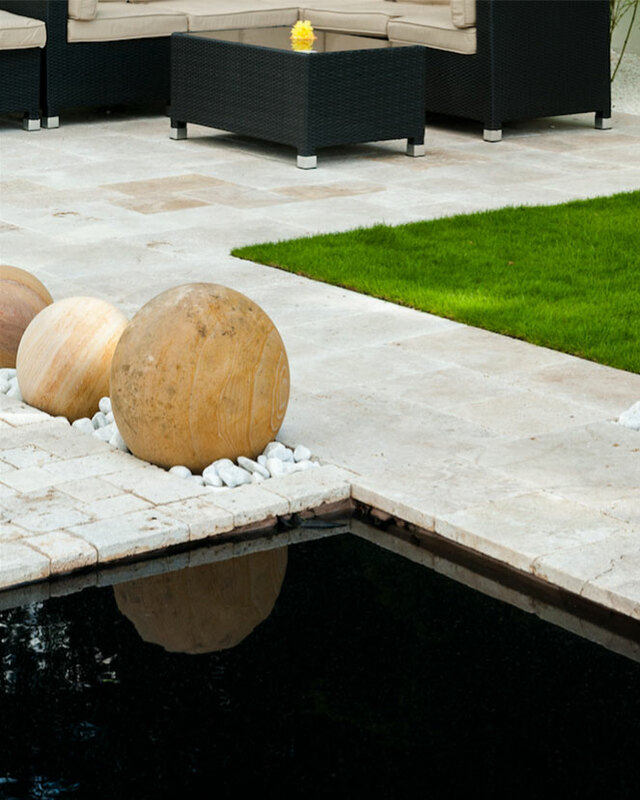 Modern gardens designs for medium gardens can be as simple as contrasting textures. Here, we used a sleek modern stone against a green planted backdrop. Also note our reliance on square geometry. With the exception of the curved wooden platform, everything is straight-edged and angular. This gives the design a cleaner, more contemporary finish. 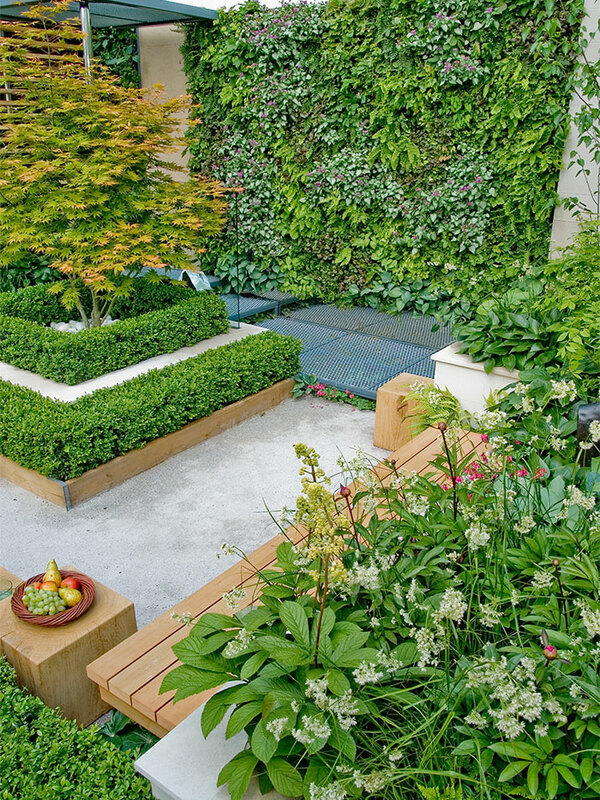 Despite the dense and varied planting, this modern garden design isn’t especially busy. The hard landscaping elements are clearly defined and uncluttered. 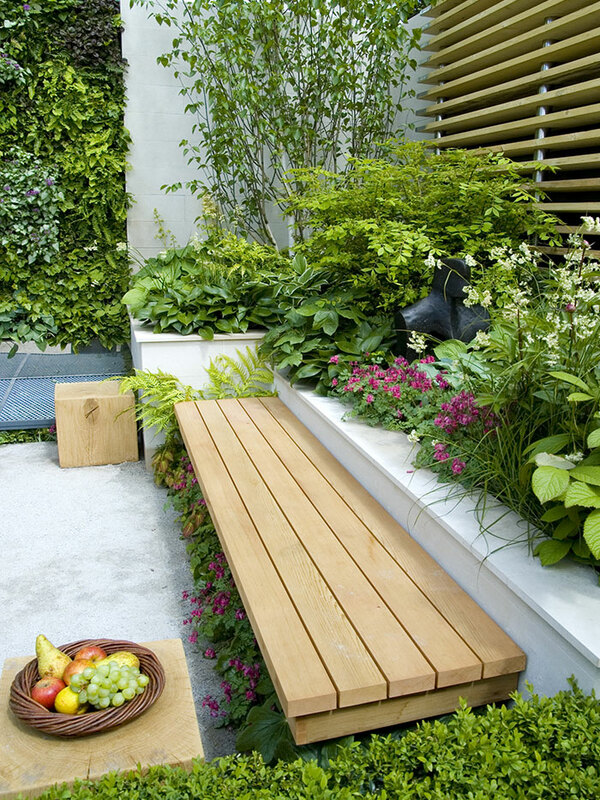 And every part of this garden contributes equally to the whole design. 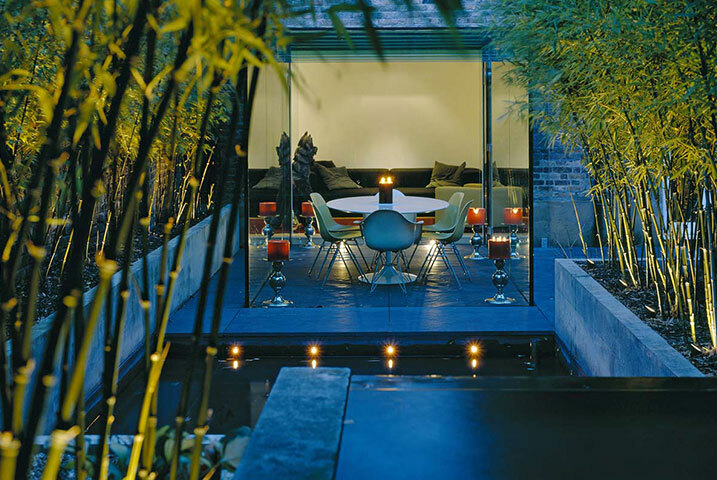 Contemporary patio design in the UK has seen a new trend emerging of late: aged or rusted steel. Up until a few years ago, stainless steel was the “in thing.” But many felt that it ended up looking a bit tired after a while. Nowadays, clients tend to prefer a more natural aesthetic. Scandinavian sensibilities are definitely the topic of today, as can be seen in Ikea or in a lot of indoor furniture styles. The lines are clean and geometric, but somehow they blend with the plants. In part this is down to the textures. However, it also has to do with our placement—particularly of the trees behind the aged steel cubes, cleverly mingling man-made and natural forms. 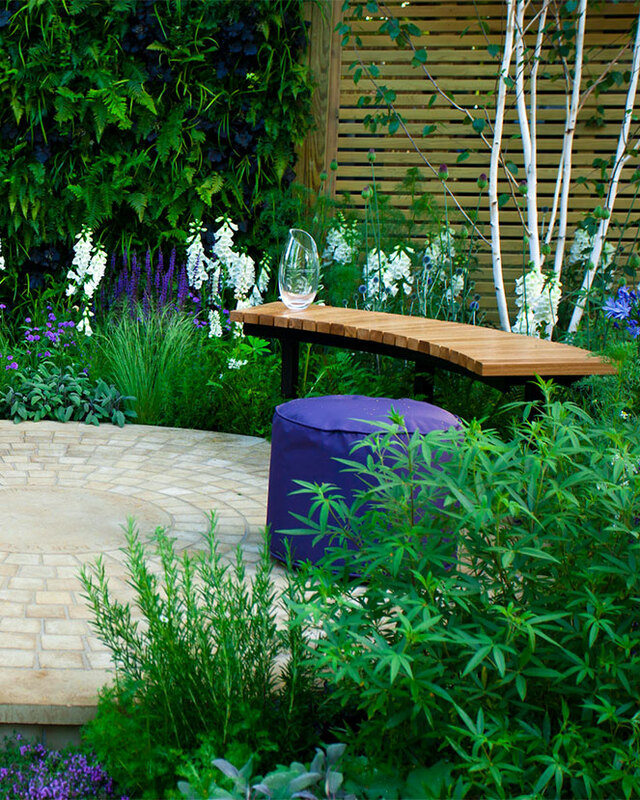 Seating is vital in this modern garden, not only for sitting on but also for dividing the space. Just as your house can be split into rooms, a garden can benefit from subdivisions. 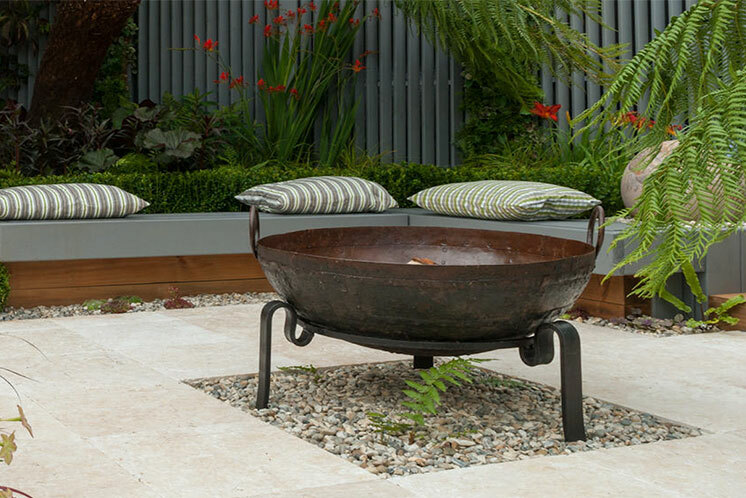 Here, the corner bench beautifully frames the focal point fire bowl as a clearly defined space for entertaining. Meanwhile, the gazebo seating area forms a perfect passageway, which takes you from one side of the garden to the other. Of course, it could look a little disjointed. But the use of gravel just ties the whole thing together. It really looks absolutely wonderful. 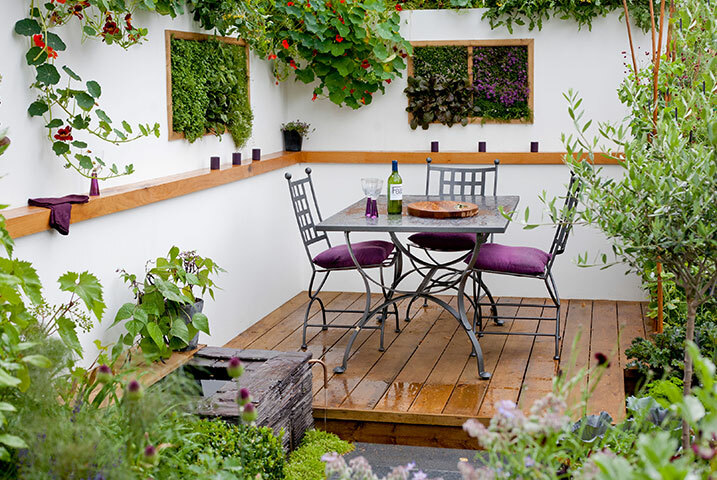 Modern gardens designs for small terrace gardens prioritise the illusion of space. Many people think an open lawn can make their garden look bigger, but the opposite is actually true. Here, the space has been filled with diverse plant textures and surface materials, adding plenty of visual interest and encouraging the eye to travel. This is key. The eye can take in a lawn at a glance and your garden will ultimately feel smaller. By holding the gaze with lots to look at, on the other hand, we have carefully created the impression of a much, much bigger garden. 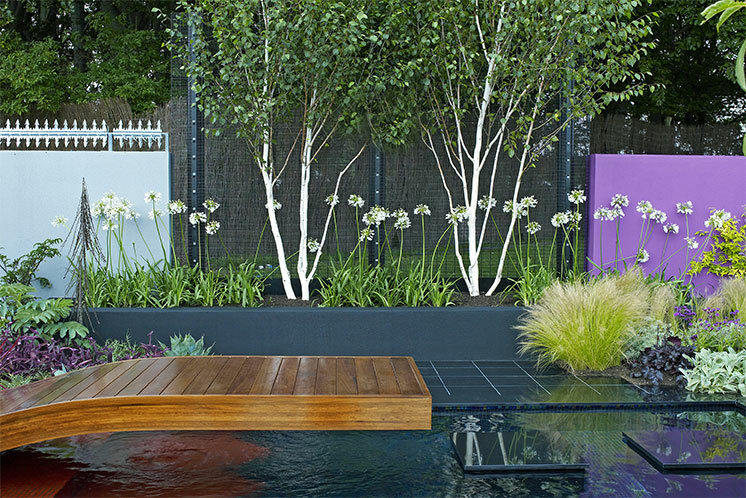 Aside from the green in this medium modern garden, there are only three colours in play: blue, white, and purple. However, the diversity of shapes more than make up for the simple mix. We have the architectural spike of the Foxglove, the sprightly clump of the Salvia, and of course the circular patio. 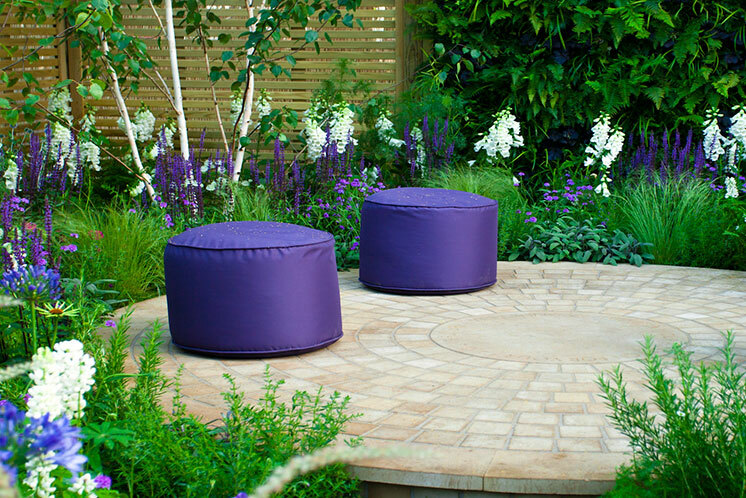 Circles are great for small contemporary gardens because they serve as an optical illusion to help us direct people’s gaze. In this case, the eye journeys outward to explore the lively perimeter. A delicate seat, which has thin legs, is a must as this allows you to see underneath. 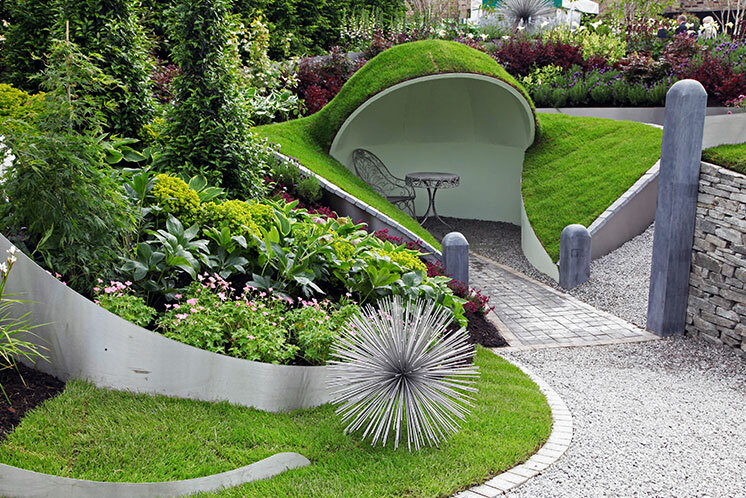 Hobbit-hole or Teletubby chic; as large modern gardens go, this one is, in our humble opinion, certainly memorable. And what a great place for the kids to grow up, having a meal with their friends in what would feel like a cave at the back of the garden. 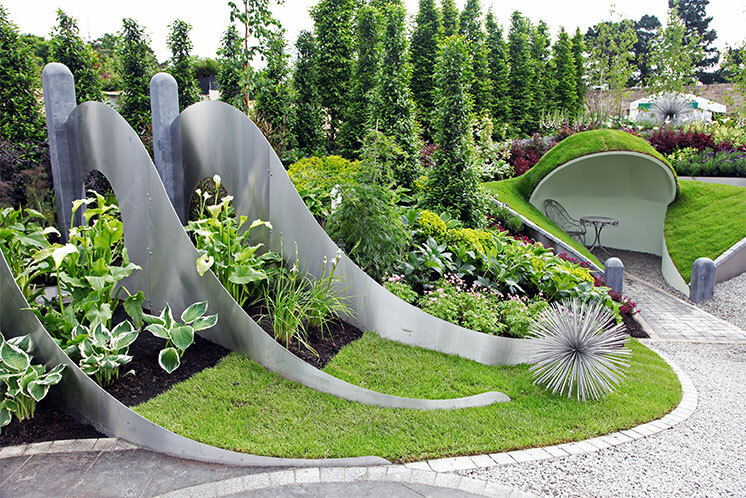 Diarmuid Gavin was the inspiration behind the amazing hillocks and humps in this design. As quirky as they are, however, they could seem a little old-fashioned to some garden lovers. Hence we extended the curvy motif to the sweeping curved steel plates, each framed by a simple granite column. A large garden pond looks absolutely amazing surrounded by coping stone. As you can see in these pictures, this one neatly echoes the shape of the neighbouring lawn. And we have created a wonderful contrast between its sunken blackness and the white of the light stone paving. One of the reasons we selected such a pale stone for this design was to reflect light back into the house. 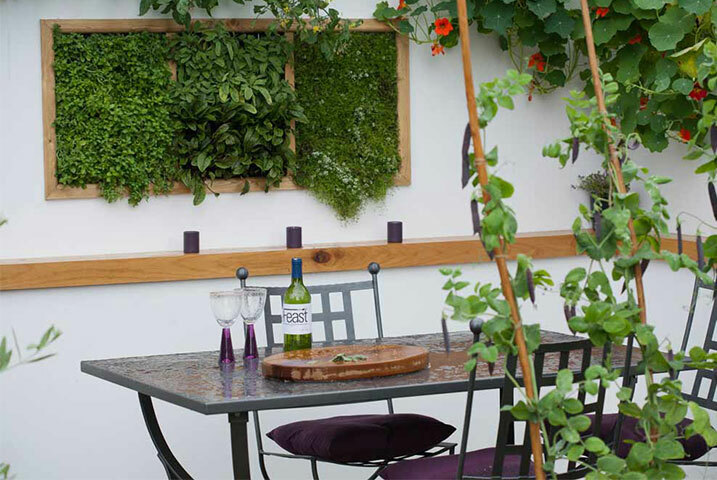 This is just one of the wonderful ways of connecting the indoor and outdoor spaces, which is a must for lifestyle gardens like this. 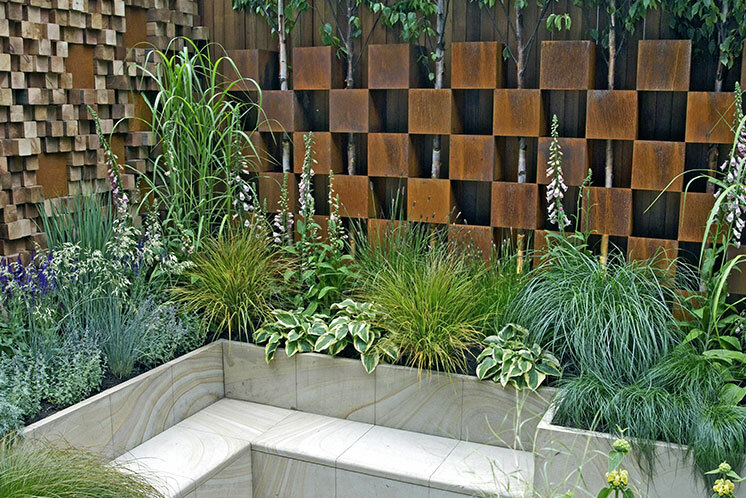 We think that there’s a lot going on in this contemporary garden design. It’s just the kind of idea our clients love. But it’s the large modern paving slabs, which tie it all together—defining a grid for this intriguing layout (and the eye) to follow. If you look carefully, you can see how we have made sure that almost every feature conforms to the geometry of the paving. 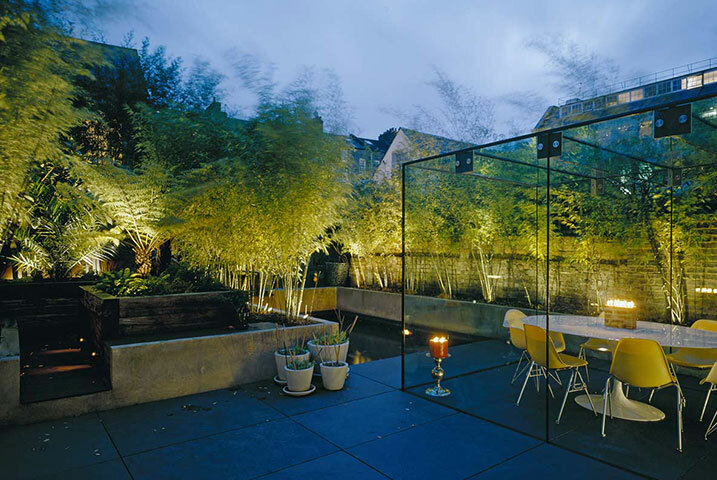 From the boundary walls, to the pond, as well as the glass panes of the open conservatory. Each of them sits along the joints between slabs. 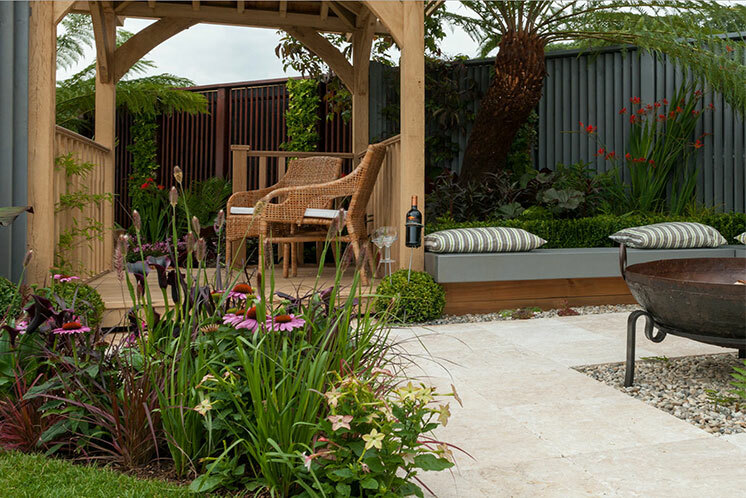 It all comes together in an amazing garden design. 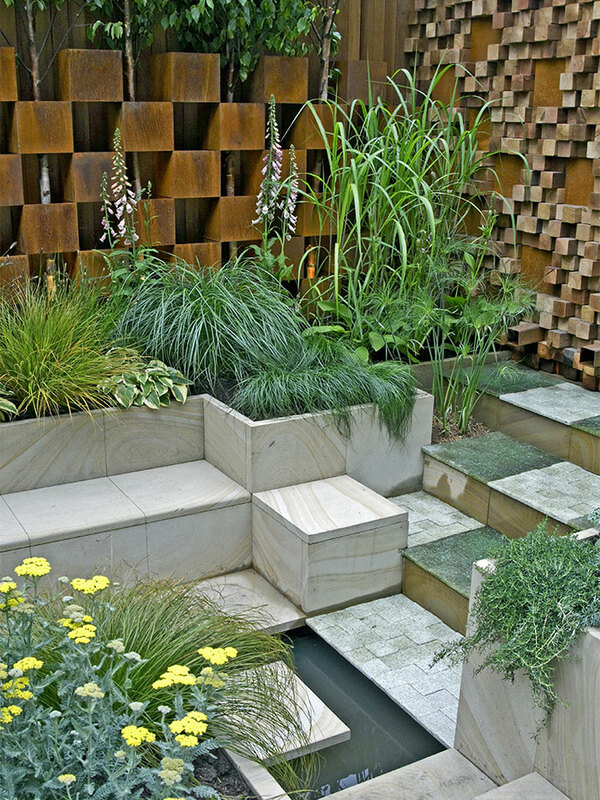 Small modern garden designs ideas often include focal point water features. However, ponds can sometimes be too dark—especially if you let them get murky. This pebble pool is a nice compromise. With a depth of just 25 centimetres and a lining of light-coloured stones, there’s little chance of it darkening the space. Actually it has the opposite effect. 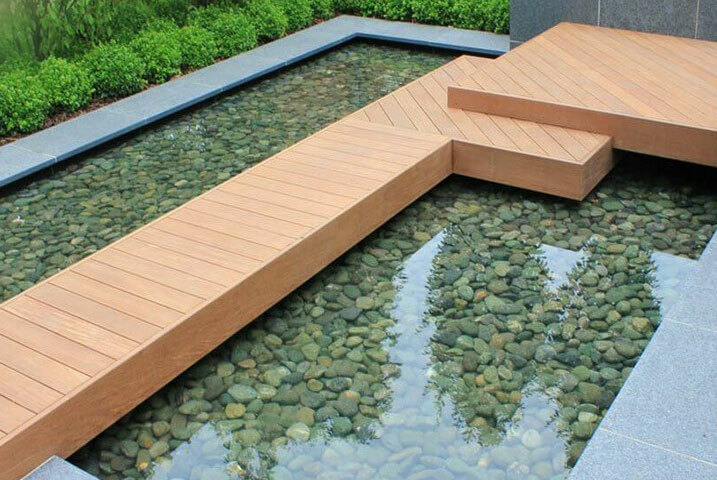 We set the walkway above the surface of the pool to make it seem more like a bridge. 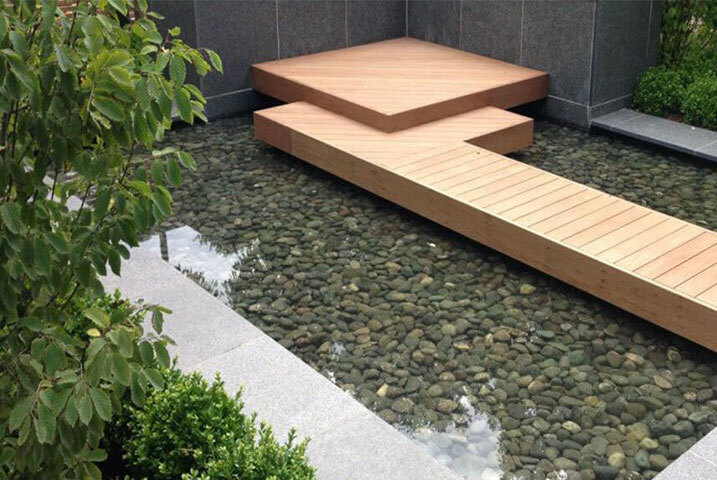 It was important to avoid bisecting the water into two separate features, as this could make the garden feel smaller.